A recent post to Thomo’s Hole from Cesar commenting on “Banjo” Patterson’s poem, The Ballad of the ‘Calliope’ by A B “Banjo” Paterson, and a previous posting in Thomo’s Hole on the Cyclone in Samoa – March 1889 led me to do a little more reading on this, especially as Patterson was a newspaper reporter by trade and as the historic texts of many of Australia’s early newspapers are now available online. Senator Bayard, the American Secretary of State, has heard that the United States subjects imprisoned by the German authorities at Samoa have been released. He has expressed the opinion that the whole situation has been exaggerated, and that probably it will be found, when detailed reports are to hand, that American rights have not been infringed. The object of the German war vessel Eber in visiting Auckland is to open cable communication with Berlin and to await despatches from the German authorities regarding Samoa. The Eber has taken no further action since the recent fighting, pending instructions from the Government. The officers of the Eber deny the statement published in a cable alleging that German sailors burned American flags and imprisoned American subjects. The object of the visit of the German warship Eber to Auckland, is to open cable communication with Berlin and await despatches. The German authorities at Samoa have taken no further action since the recent fighting, and will not do so pending instructions from their Government. The officers of the Eber deny the statement which alleged that German sailors had burned American flags and imprisoned American subjects, H.M.S. 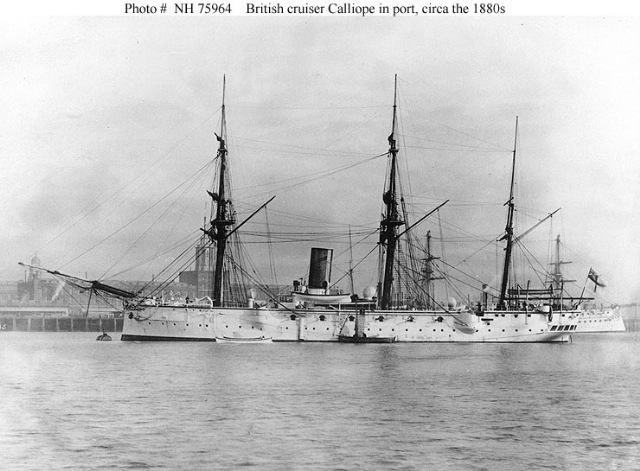 Calliope sailed for Samoa to-day to relieve H.M.S. Royalist. A fire occurred at the German consulate at Apia on the 9th inst. It was caused by a lamp upsetting. Before the flames were extinguished 9 large and 13 smaller buildings were destroyed, including the Hamburg Hotel and a Samoan church. Some fire – 22 building destroyed and supposedly an accident, although at a time of a great deal of international tension. Lieutenant Kane, who died so gallantly at Fort Itala on September 26, with “no surrender” as his last words, was a nephew of Rear-Admiral Henry C. Kane, C.B., whose indomitable pluck and seamanship saved the warship Calliope at Samoa in in March, 1889-when, in the teeth of an almost unprecedented hurricane, he, relying on his engines, steamed to sea. It will be remembered that the vessels that remained at the anchorage were all wrecked, with a loss of 130 lives. Lieutenant Kane was also a nephew of Mr. Justice Kennv, who was M.P. for the Stephen’s Green division of Dublin and Irish Solicitor-General in the Government. I can see I will need to do some research on Fort Itala now, which was, as I understand, captured by the Boer General Botha on 26 September 1901. This was after an unsuccessful attempt earlier (and reported in the New York Times of the time). All in all, the Calliope is definitely something of a “Boys Own” kind of tale.